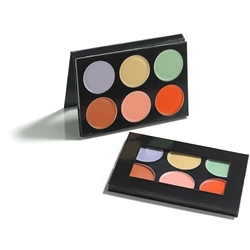 The six color neutralizer color Correct-It neutralizer palette was designed to meet the rigorous demands of a professional makeup artist. It offers consistent, creamy coverage to neutralize any skin discoloration and blemishes. Included are six different color neutralizers: periwinkle, daffodil, mint, tangerine, sherbet, and salamander. The neutralizers are formulated with skin tones to avoid whiteness in the base foundation with many other neutralizers.